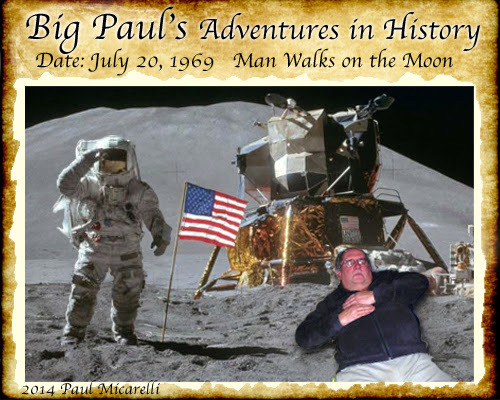 This is the fifth set of of "adventures" as he sleeps his way through history. 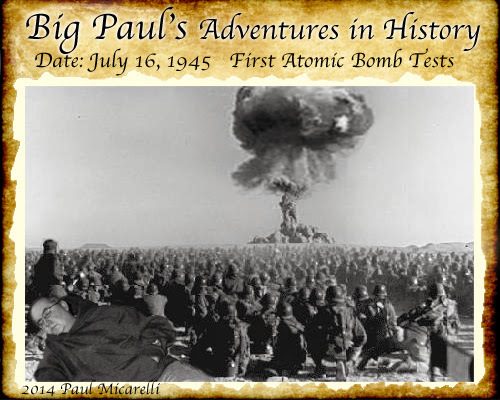 To commemorate my Dad's birthday, I made the 3 new adventures below. my Dad continued to snooze away next to the Lincolns. 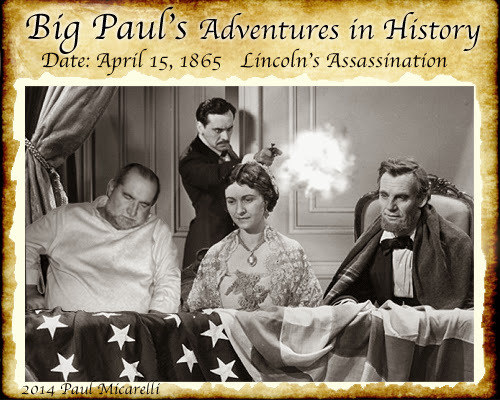 was not enough to wake Big Paul out of his slumber. the astronauts claimed they could hear my Dad snoring. In 2003, I created seven 3D images that I intended to be a series. 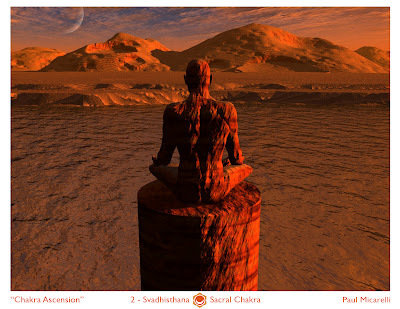 The images show a solitary, meditating figure in different environments. Each setting corresponds to the ancient metaphysical energy system within the body, known as "chakras". I am not a skilled chakra meditation practitioner, so I approached this as a metaphorical work of art. I've finally decided to post the "Chakra Ascension" series, for other people to contemplate. Now that I've posted all the individual entries, this is a recap of the entire series. • "Chakra Ascension" Series- 1 Muladhara "Root"
• "Chakra Ascension" Series- 2 Svadhisthana "Sacral"
• "Chakra Ascension" Series- 3 Manipura "Navel"
• "Chakra Ascension" Series- 4 Anahata "Heart"
• "Chakra Ascension" Series- 5 Visuddha "Throat"
• "Chakra Ascension" Series- 6 Ajna "Third Eye"
• Chakra Ascension" Series- 7 Sahasrara "Crown"
• "Chakra Ascension" Series- 8 Prabhāsvara "The Clear Light"
I am not a chakra meditation practitioner, so I approached this as a metaphorical work of art. I've finally decided to post the "Chakra Ascension" series, for other people to contemplate. This is the last image of the series, that I planned to post today on the Summer Solstice- June 21, 2014. Scroll down for the description of Prabhāsvara, "The Clear Light". After the ascension through all 7 chakra levels, one's consciousness transcends the illusory mental constructs that make up our individual & consensus realities. 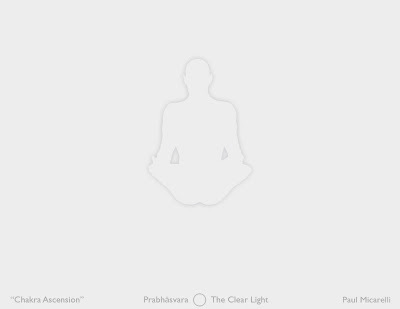 All that remains is Prabhāsvara, "The Clear Light". This is the state of being that is beyond words & symbols, which cannot be described by conventional language. 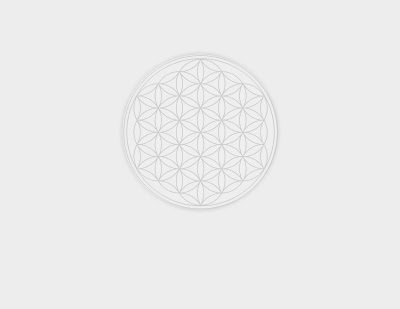 Instead of a verbal description for this final level, I used an image of "The Flower of Life". This is a sacred geometric symbol, created from a pattern of equidistant, interlocking circles. It represents the interconnected, infinitely complex nature of the field of energy underlying all aspects of reality. "The Clear Light" is the energetic source of all manifestations that create our world. The Observer has now completely merged with the pure, white luminosity of The Clear Light- the fundamental, infinite field of energy that underlies ALL of reality. I personally had a near-death experience, in which my consciousness was dissolved into The Clear Light. There was no sight, sound, emotion, or conscious thought, of any kind. My mind was abiding in an all-enveloping silence... surrounded by interpenetrating, pure white luminosity. Beyond the highest ascension of one's consciousness, there is only this infinite field of energy. "The Clear Light" is just a name for the fundamental source from which everything arises- from quantum fluctuations to the vast structures of the cosmos. This source can be called “The Clear Light” • “God” • “the Quantum Field” • “the Universe” • “Brahma” • “Tao” ...or any other name. Regardless of what we call it, the fundamental "One-ness" of reality remains a self-evident truth. To deeply realize this truth, and all the lessons of this series, YOU must become The Observer. Look within yourself, while integrating all these ideas from the various stages. Try to maintain an open mind, deep inner vision, compassion for others, and a love of Life. Then, you will be a master of your own Ascension into a higher consciousness. I'll be introducing a new image every day, from now until the Summer Solstice- June 21, 2014. Scroll down for the description of Chakra 7, Sahasrara. This image represents the 7th level of Ascension- the Crown Chakra, Sahasrara. The color associated with this chakra is violet, and its element is pure consciousness. Sahasrara is located at the crown, or top, of the head. It is sometimes called the "thousand-petaled lotus" and is considered the chakra of thought and consciousness. "Consciousness" can be understood as the infinite field of information that permeates the Universe- from the smallest particles to the vast cosmos, and everything in between. Appearing like a violet 'flying saucer' above The Observer’s head, the spinning Sahasrara chakra connects upward, into The Infinite, through a beam of coherent light. This is the gateway to cosmic consciousness. At this final stage in our Ascension, we realize that what we think of as an "individual" or "person" is just a brief process within unimaginably long cycles of time, taking place in the practically infinite expanse of space. When we can deeply recognize these truths, we begin to break down the delusion of seeing ourselves as entities that are separate from the totality of the Universe. In this image, the physical body of The Observer has further de-materialized & has detached from the grounding pillar below. Not only is it impossible to discern the front of the body from the back, but the figure has become transparent, like a diamond that is clear yet indestructible. The Observer has begun to merge with the pure, white luminosity of The Clear Light. This is the fundamental, infinite field of energy that underlies ALL of reality. 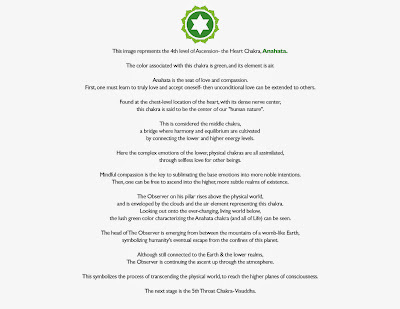 Scroll down for the description of Chakra 6, Ajna. This image represents the 6th level of Ascension- the Third Eye Chakra, Ajna. The color associated with this chakra is indigo, and its element is light. Ajna is located at the level of the brow, and is associated with the pineal gland in the middle of our brain. This small, pinecone-shaped organ is light-sensitive and is thought to regulate our cycles of sleep and awakening. It is also believed to be "The Seat of the Soul". This stage of spiritual evolution is where insight is developed, beyond the information perceived by the senses. When one releases attachment to the physical senses and the emotions of the lower levels, it is possible to become more in tune with the subtle influence of one's intuition. By focusing on the present moment, keeping a clear mind, and focusing inward, one can access the higher planes of consciousness that have been explored by mystics for millennia. At this stage of ascension, The Observer has become luminous and ethereal. The body is transparent, and you cannot discern the front from the back. Duality, which is the illusion of separateness, begins to disappear. The imagined boundaries between • mind & body • physical & spiritual • outer & inner • self & other • are all beginning to dissolve. The viewpoint is now outside the atmosphere, beyond the confines of the physical world. The Observer is merging into the limitless expanse of the starry cosmos. Infinite space surrounds and penetrates the etheric body. Even the grounding pillar, that once provided solid support for The Observer throughout the ascension process, is breaking down into energetic waveforms. The radiance of our closest star, The Sun, symbolizes the light that permeates the Universe and our inner being, as we open up ourselves to the vast, energetic nature of reality. The Observer abides in openness & stillness, but the journey is not yet complete. Cultivating a continual peace of mind will finally result in the ultimate manifestation of one's inner vision, as all boundaries are transcended during the next transition of consciousness. 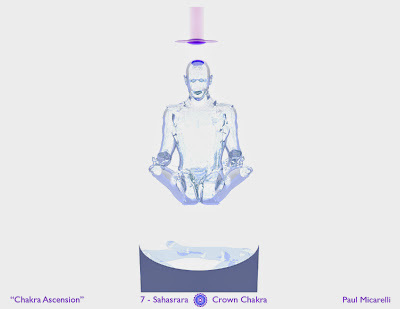 The next stage is the final one in the ascension, the 7th Crown Chakra- Sahasrara. Scroll down for the description of Chakra 5, Visuddha. This image represents the 5th level of Ascension- the Throat Chakra, Visuddha. The color associated with this chakra is blue, and its element is the mystical ether- the energy field that permeates the Universe. Visuddha, located at the throat, is the chakra associated with speech & communication. Through creative self-expression, such as music, art, writing & speaking, one can develop their own spiritual growth by sharing their wisdom with others. Through the many forms of digital media, people are now able to create and share information, opinions, art, and ideas in ways that are unprecedented. This accelerating increase in connectivity is allowing the human race to rapidly outpace our physical evolution. The power of technology, especially that of computers & the Internet, has greatly increased the human race's capacity for communicating and sharing knowledge with one another. At this level, The Observer is mentally connected to abstract cybernetic entities, through beams of light. The human being is now merging physically & mentally with the machines, to greatly enhance the conscious experience. The glowing obelisks represent humanity's technical heritage, continuing from ancient times to the present day. Through focused light beams of information, these obelisks and The Observer are connected to a giant techno-sphere, emerging from a higher plane. We are synthesizing our past, present, and future- into a new form of consciousness, that is timeless and all-encompassing. 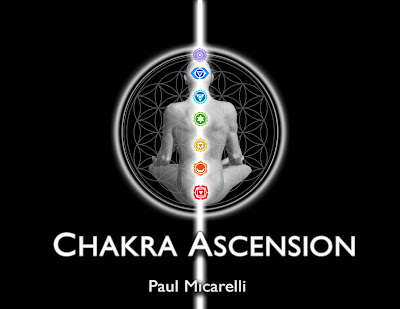 At this stage of the ascension, The Observer is far above the primal energy levels, characterized by the lower chakras. The viewpoint is now high up in the atmosphere, with clouds obscuring the physical landscape, but it has not yet fully transcended the world below. Despite the many benefits of technological progress, we must also be able to shut off these outward connections for further spiritual advancement. We have to look inward, and quiet the mind's desire to constantly communicate, in order to experience a higher level of being. 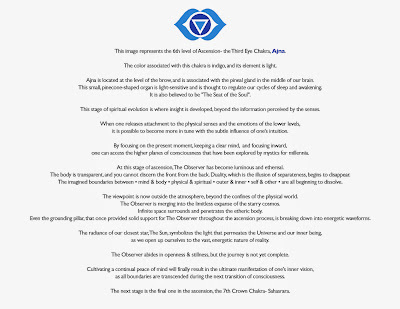 The next stage is the 6th Chakra, the Third Eye- Ajna. Scroll down for the description of Chakra 4, Anahata. This image represents the 4th level of Ascension- the Heart Chakra, Anahata. The color associated with this chakra is green, and its element is air. Anahata is the seat of love and compassion. First, one must learn to truly love and accept oneself- then unconditional love can be extended to others. Found at the chest-level location of the heart, with its dense nerve center, this chakra is said to be the center of our "human nature". This is considered the middle chakra, a bridge where harmony and equilibrium are cultivated by connecting the lower and higher energy levels. Here the complex emotions of the lower, physical chakras are all assimilated, through selfless love for other beings. Mindful compassion is the key to sublimating the base emotions into more noble intentions. Then, one can be free to ascend into the higher, more subtle realms of existence. The Observer on his pillar rises above the physical world, and is enveloped by the clouds and the air element representing this chakra. Looking out onto the ever-changing world below, the lush green color also characterizing the Anahata chakra (and all of Life) can be seen. The head of The Observer is emerging from the mountains of the womb-like Earth, symbolizing humanity's eventual escape from the confines of this planet. 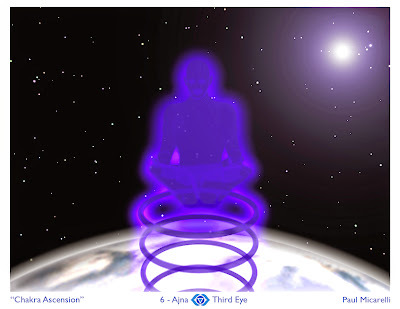 Although still connected to the Earth & the lower realms, The Observer is continuing the ascent up through the atmosphere. This symbolizes the process of transcending the physical world, to reach the higher planes of consciousness. 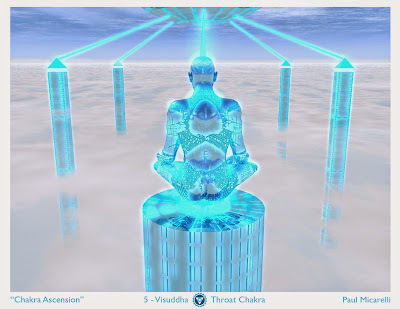 The next stage is the 5th Throat Chakra- Visuddha. Scroll down for the description of Chakra 3, Manipura. This image represents the 3rd level of Ascension- the Navel Chakra, Manipura. The color associated with this chakra is yellow, and its element is fire. The fire quality of Manipura radiates warmth and light energy. The attributes of this energy level relate to the intellect, personal power, and transformation. Power is created at this stage by fusing the polarities formed in the previous stages, and using all the knowledge gained from the senses and emotions of the dualistic lower levels. In terms of human history, this level can be seen as a nostalgic impression of the mystical age that existed before remembered time- in which such magnificent creations as the Pyramids, Stonehenge, and other ancient structures showed a level of sophistication that baffles us, even today. The pyramids, with their polished limestone faces and gold capstones, represent wisdom combining the perceived duality of mind and body into a completely realized human being. From the empty desert, man can raise seemingly impossible monuments, using his vitality and inner strength. However, care must be taken, in order to prevent such powerful feats from distorting the ego's sense of self-importance. 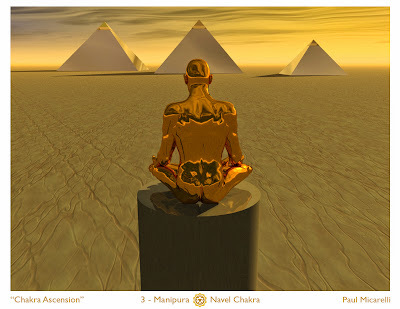 The gold capstone atop the pyramid mimics the golden form of The Observer, on top of his pillar- a symbol of humanity as the culmination of the material world, in which the four elements converge into the unique phenomenon of the spiritual human being. This idea is the basis of the traditional philosophy of alchemy, generally believed to be concerned with transmuting base elements into gold. However, this was only a partial truth behind "The Great Work", which was actually the search for the process to purify and elevate the soul. The quest to transform ordinary materials into gold was an analogy- for developing a radiant, perfect spirit. 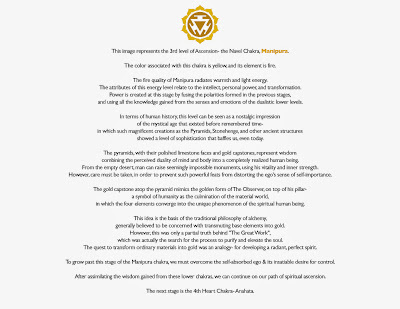 To grow past this stage of the Manipura chakra, we must overcome the self-absorbed ego & its insatiable desire for control. After assimilating the wisdom gained from these lower chakras, we can continue on our path of spiritual ascension. Scroll down for the description of Chakra 2, Svadhisthana. 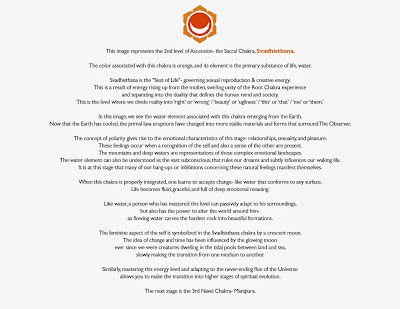 This image represents the 2nd level of Ascension- the Sacral Chakra, Svadhisthana. The color associated with this chakra is orange, and its element is the primary substance of life, water. Svadhisthana is the "Seat of Life"- governing sexual reproduction & creative energy. This is a result of energy rising up from the molten, swirling unity of the Root Chakra experience and separating into the duality that defines the human mind and society. In this image, we see the water element associated with this chakra emerging from the Earth. Now that the Earth has cooled, the primal lava eruptions have changed into more stable materials and forms that surround The Observer. The concept of polarity gives rise to the emotional characteristics of this stage- relationships, sexuality, and pleasure. These feelings occur when a recognition of the self and also a sense of the other are present. The mountains and deep waters are representations of these complex emotional landscapes. The water element can also be understood as the vast subconscious, that rules our dreams and subtly influences our waking life. It is at this stage that many of our hang-ups or inhibitions concerning these natural feelings manifest themselves. When this chakra is properly integrated, one learns to accepts change- like water that conforms to any surface. Life becomes fluid, graceful, and full of deep emotional meaning. Like water, a person who has mastered this level can passively adapt to his surroundings, but also has the power to alter the world around him- as flowing water carves the hardest rock into beautiful formations. The feminine aspect of the self is symbolized in the Svadhisthana chakra by a crescent moon. The idea of change and time has been influenced by the glowing moon ever since we were creatures dwelling in the tidal pools between land and sea, slowly making the transition from one medium to another. Similarly, mastering this energy level and adapting to the never-ending flux of the Universe allows you to make the transition into higher stages of spiritual evolution. The next stage is the 3rd Navel Chakra- Manipura. Scroll down for a description of Chakra 1, Muladhara. 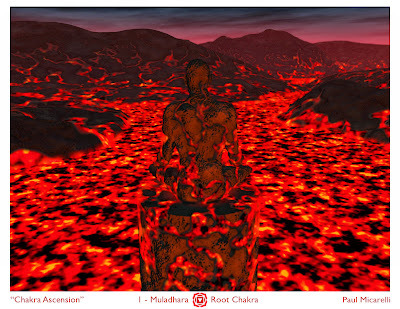 This image represents the 1st level of Ascension- the Root Chakra, Muladhara. The color associated with this chakra is red, and the element is earth. This energy center is located at the base of the spine. 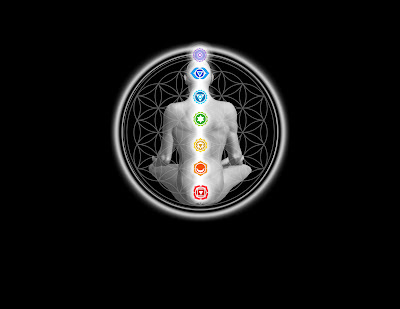 In this image we see the representation of this chakra, the first stage of spiritual evolution. 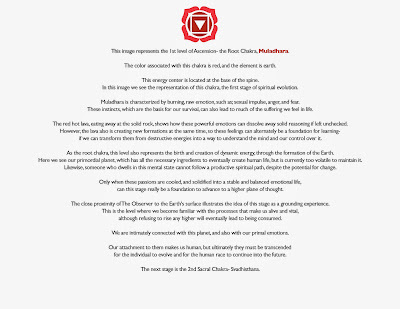 Muladhara is characterized by burning, raw emotion, such as; sexual impulse, anger, and fear. These instincts, which are the basis for our survival, can also lead to much of the suffering we feel in life. The red hot lava, eating away at the solid rock, shows how these powerful emotions can dissolve away solid reasoning if left unchecked. However, the lava also is creating new formations at the same time, so these feelings can alternately be a foundation for learning- if we can transform them from destructive energies into a way to understand the mind and our control over it. As the root chakra, this level also represents the birth and creation of dynamic energy, through the formation of the Earth. Here we see our primordial planet, which has all the necessary ingredients to eventually create human life, but is currently too volatile to maintain it. Likewise, someone who dwells in this mental state cannot follow a productive spiritual path, despite the potential for change. Only when these passions are cooled, and solidified into a stable and balanced emotional life, can this stage really be a foundation to advance to a higher plane of thought. The close proximity of The Observer to the Earth's surface illustrates the idea of this stage as a grounding experience. This is the level where we become familiar with the processes that make us alive and vital, although refusing to rise any higher will eventually lead to being consumed. We are intimately connected with this planet, and also with our primal emotions. Our attachment to them makes us human, but ultimately they must be transcended for the individual to evolve and for the human race to continue into the future. This first set is the Overview, with some of my general thoughts on the series. I hope it is enjoyed and appreciated, while perhaps even enlightening some people who take the time to consider the meanings within. The "Chakra Ascension" series was a creative exercise to combine many different ideas into one project. It's a set of 3D images and text in which I've tried to pack as much meaning as possible about mind, body, spirit, the universe, and the human experience- into a series of simple, yet interesting, images. Each individual image has only limited significance by itself. The overall continuum of images represents the process of working through the many stages of life both on the level of the individual and of human society, in general. The theme used to name the images of this series is the ancient system of "chakras". In this metaphysical system, various places in the body, from the base of the spine to the top of the head, are visualized in order to store and transform energy within the body. These chakra energy centers have some basis in anatomy, with most being located at the sites of major nerve bundles. However, they are highly conceptual, used to unlock the power of of mind and imagination. 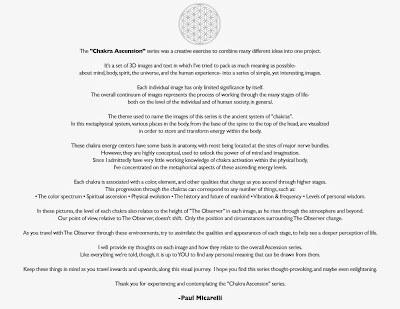 Since I admittedly have very little working knowledge of chakra activation within the physical body, I've concentrated on the metaphorical aspects of these ascending energy levels. s that change as you ascend through higher stages. • Levels of personal wisdom. 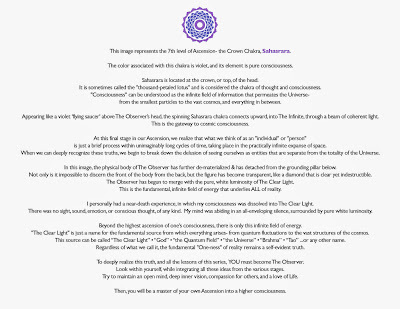 In these pictures, the level of each chakra also relates to the height of "The Observer" in each image, as he rises through the atmosphere and beyond. Our point of view, relative to The Observer, doesn't shift. Only the position and circumstances surrounding The Observer change. As you travel with The Observer through these environments, try to assimilate the qualities and appearances of each stage, to help see a deeper perception of life. I will provide my thoughts on each image and how they relate to the overall "Chakra Ascension" series. Like everything we're told, though, it is up to YOU to find any personal meaning that can be drawn from them. Keep these things in mind as you travel inwards and upwards, along this visual journey. I hope you find this series thought-provoking, and maybe even enlightening. Thank you for experiencing and contemplating the "Chakra Ascension" series. This animated GIF I saw on The Chive combines 2 of my favorite things, crazy monkeys & a CGI lightsaber from Star Wars. 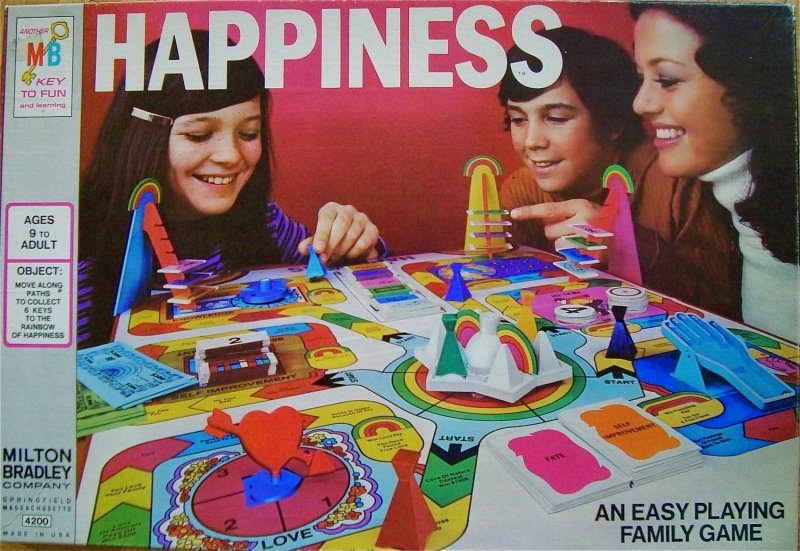 Here is another obscure, classic game that I came across recently- The Game of Happiness, by Milton Bradley. This game was produced in 1972, and it has the clear influence of the 60's era, with the Hippie movement & "The Summer of Love". The board features bright psychedelic-inspired colors & themes such as; love, knowledge, friendship, faith, self-improvement, & health. "Groovy!" 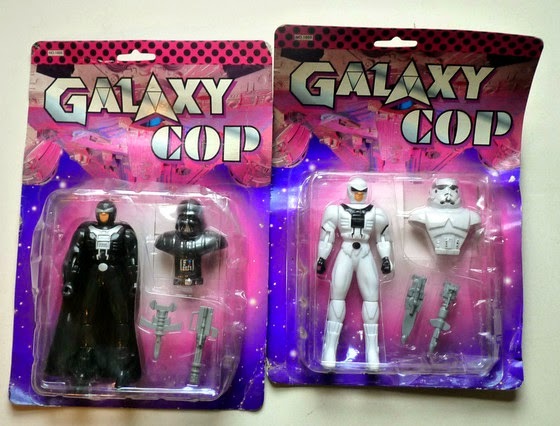 I've been posting lately about crazy product & packaging design. This is another far-out example of a family game from the 1960's that I saw on Neatorama. 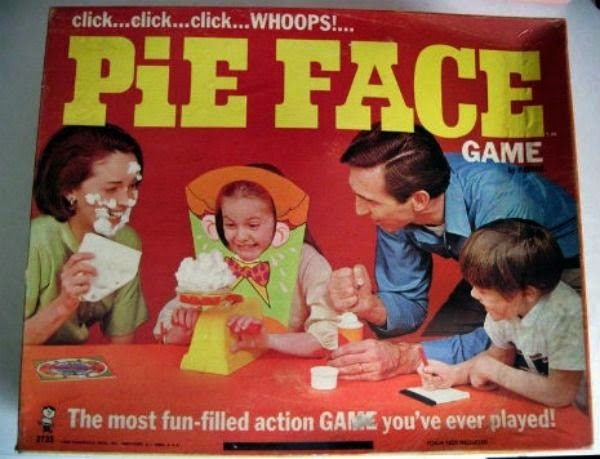 The Pie Face Game was a take on a common theme, in which there is a slow build-up & anticipation for something dramatic to happen. In this case, one of the players gets a pie to the face. Besides the impracticality & messiness of the game, it also probably had very low replay value. 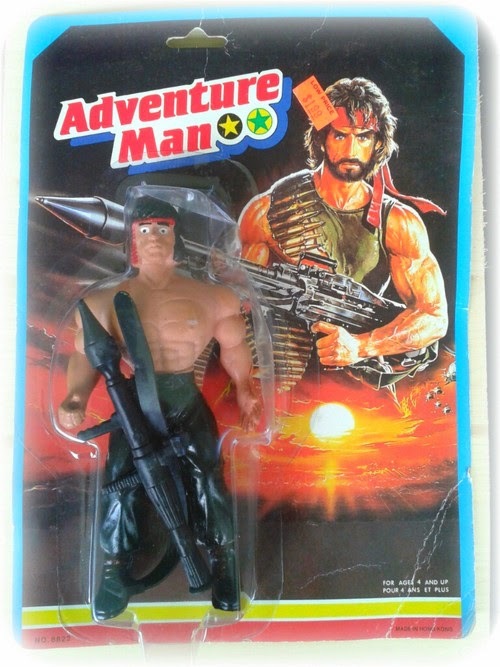 I'm continuing the theme of ridiculous product packaging. As a graphic artist, seeing horrible design is a guilty pleasure of mine. This is a funny fake product idea, for those of us who would like to spontaneously take a nap anywhere we go. 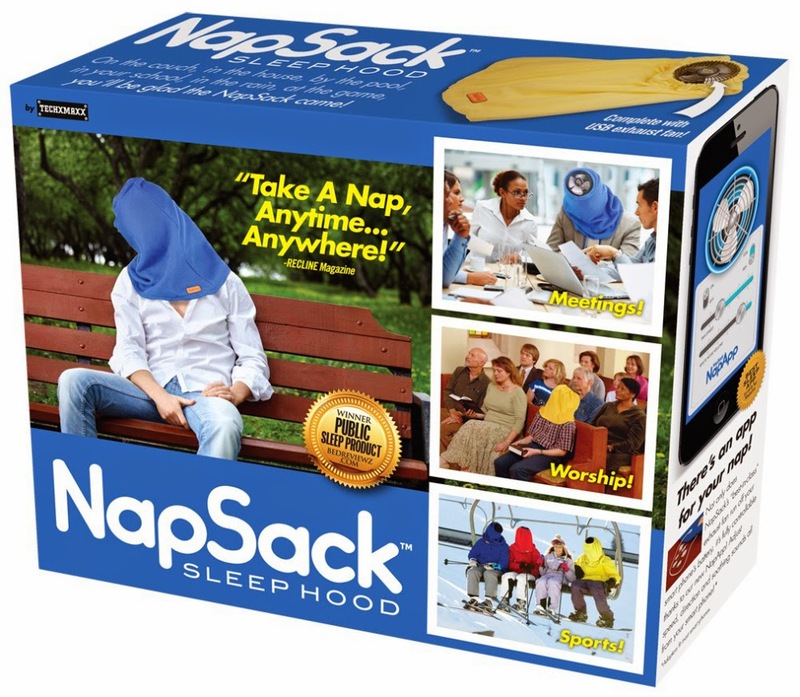 The Nap Sack is a sleep hood that lets you "Take a Nap Anytime! Anywhere!". It has a built-in USB fan to keep your head cool, and can be controlled using the "Nap App". 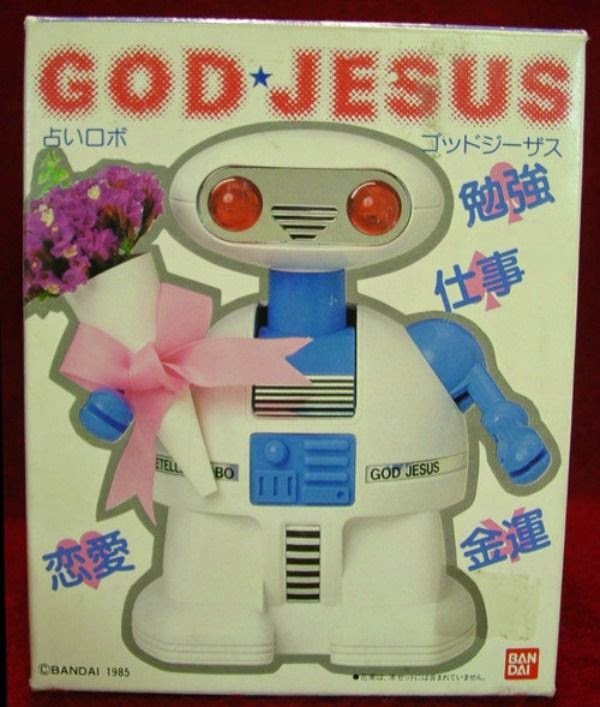 Use it for meetings, worship, or sports!!! When I was young, I first noticed that sometimes these transparent, irregular shapes would appear in my field of vision. I had enough sense to figure that they were little pieces of dust or something, floating in my eyeball. It turns out this phenomenon is fairly common. They are actually caused by pieces of the vitreous humor, a gel-like substance in the eye, breaking off and causing a shadow on the retina. We perceive these shadows as the "floaters".